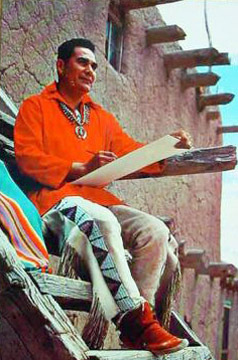 Popovi Da was born April 10, 1923 at San Ildefonso Pueblo. Born Antonio Martinez he legally changed his name to his Indian name in 1948 to Popovi Da, which means Red Fox. He was the son of the famous potter, Maria (1887-1980) and Julian Martinez (1885-1943). Popovi was a very talented artist working in watercolor painting, jewelry, and pottery. Popovi studied art at the Indian School in Santa Fe when he was in his early thirties. After his service in the Army during World War II he became serious about pottery making. He began helping his mother Maria with digging clay, gathering temper, and firing pots in the late 1940s. In 1948 Popovi Da and his wife Anita Da opened the Popovi Da Studio of Indian Art at San Ildefonso Pueblo to promote and sell Indian arts and crafts and display Maria's exceptional pottery. He began helping with the decorating and painting of Maria's pottery in 1950. Signature on the pot the amount of time he spent working closely with his mother, Popovi made few pieces of his own. What pieces he did make have now become rare collectors items. Popovi's son Tony Da also became an excellent potter. In 1967, the Institute of American Indian Art presented an exhibition on the Martinez family pottery. The exhibit represented three generations of Martinez family potters including Maria, Popovi and Tony Da. The exhibition was so successful that it traveled to Washington, D.C. where the Martinez family was honored in a ceremony led by Secretary of Interior Stewart Udall for their significant contributions to American art. The Martinez family pottery can be found in collections throughout the world. Popovi was also a great experimenter. In 1956, he started working with polychrome ware. 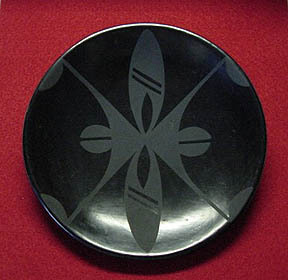 After the introduction of black-on-black ware around 1925 the making of polychrome ware had nearly died out. Popovi is credited with the revival of polychrome ware at San Ildefonso Pueblo. One of his polychrome pieces won Best in Show at the Gallup Inter-Tribal Ceremonial in 1957. Popovi began experimenting with firing techniques in 1961. He developed a new color: sienna, which he accomplished through a two-firing process. He also developed a technique of achieving two colors on the same vessel called duotone. His original black-and-sienna ware was also a two-firing process. 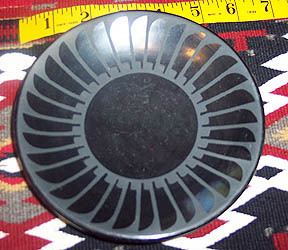 Another popular new finish he developed was Gunmetal ware. Popovi was also the first contemporary pueblo potter to add turquoise inlay to his pieces. Popovi's first piece with his signature 'Popovi' appeared in 1965. Pieces signed 'Marie/Popovi' were made by his mother, Maria, and decorated by Popovi.